Huge Explosions At Weapons Depot In Northern Ukraine. Some Say It Contained Surface-To-Air Missiles 4.5 out of 5 based on 8 ratings. 8 user reviews. Early on October 9th around 12,000 people were evacuated from around 30 towns in the affected area. Airspace within 20 km of the depot was closed, railroad and road traffic were also put on hold when explosions began in an arms depot in Northern Ukraine. Emergency services said there was no information on any deaths or injuries in the incident near the town of Ichnya, more than 170 kilometers from Kiev. The initial reports of explosions in the depot began at 3:30am. Five of the warehouses were still burning in the morning. RT cited local’s comments on social media saying that the blasts smashed doors and windows. There are numerous videos and images of the night sky lit up by the explosions. RT claimed that more than 60 people had gone to local hospitals to seek help, despite authorities claiming that there were no casualties. Emergency services were deployed on the scene. President Petro Poroshenko’s spokesman posted on Facebook that the President had called a meeting of the heads of security forces and promised to give residents all the necessary help. Ukraine’s Interfax news agency reported that military prosecutors opened an investigation into possible negligence by officials. In recent years there have been several fires have happened in ammunition and weapons depots. In 2017, explosions at a weapons depot in the Vynnytsya region, 270 km west of Kiev, forced the authorities to evacuate 24,000 people. Following the incident, a parliamentary defense committee inspected other depots. They discovered significant shortcomings in how the depot in the Chernihiv region was managed, according to Dmitry Tymchuk, who was on the committee. In March, smoke was rising above a former technical area of a military arsenal in Balakleya. This is where the depot caught fire in 2017. There are, as of October 9th, five versions of what the cause of the incident might have been. It could be negligence on the side of the officials that are operating the warehouse and poor maintenance led to the fire and following explosions. It could be corruption in Ukraine, the explosions are used as a cover for large thefts of weapons and ammunition. It could be resistance against the Ukrainian government in some regions. The poor security of these depots allows for the local resistance, if there is such a resistance, to cause a situation of the sort. The Ukrainian Ministry of Defense blames Russia, so it could be possible that “highly likely Russian agents” started the fire and the following explosions. And finally, Ukrainian 112 TV Channel reported that the depots also contained surface to air missiles and documents related to them. If these are BUK missiles, it is possible that the Ukrainian side sabotaged the facility to burn the evidence, following the Russian briefing that showed that the missile that downed the MH-17 flight was of Ukrainian origin. Investigations in the incident will possibly provide clarity in the following days and weeks. Fail-Nation is simply being itself… no effort required. foreign country. Russian history began in what was called Kievan-Rus. part of Russian history and, indeed, of Russia. With that I suppose Porkysenko and his neo-nazi orcs has legitimate claim for all of Russia. Zionist parasitic penetration of Ukraine is quite severe, IDF snipers were responsible for the massacre of ethnic Russians at the maidan in Kiev. 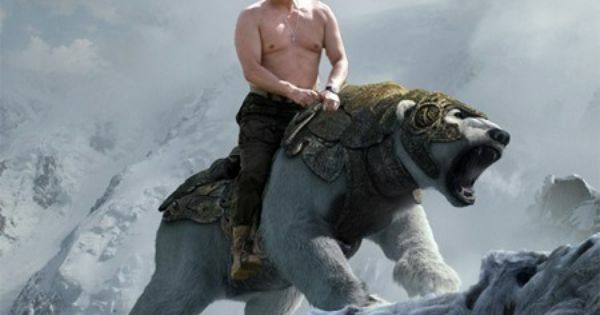 A bare-chested man, resembling Putin, was seen riding away on a bear. ..littering the ground with perfume bottles as he passed, while a lone BUK launcher trundled behind. Soon BBC will show gay tourists with Nina Ricci perfumes that blew up the ammo dump. On a more serious note, this was one of the largest Uki ammo dumps and used as a warehouse for NATO weapons and the damage is pretty heavy duty. Too funny, this was the largest ammo dump in Ukraine and full of newly acquired NATO and Zionist weapons and now all up in smoke. GRU at its best. Also known as the Aquarium. Maybe the best pieces were ‘acquired’ by Israel and the rest went up in smoke to cover their departure. Ukraine like the Zionist entity is not a real country but a historic part of Russia both ethnically and geographically. The US losers and their NATO puppets are using Ukraine as a forward staging area to encroach on Russia proper and are warehousing ammunition and weapons in huge ex-Soviet era warehouses, there are many rogue units in Ukraine like the ones who used a Soviet era BUK to down a Malaysian airliner. This is most like an internal sabotage as Ukrainian military is not enamored with NATO agenda as most were trained in mother Russia. This ordinance dump was a major one and the damage is quite severe as several thousand holols had to be evacuated and millions of NATO weapons up in flames. Nothing new there. Simply covering what was stolen. Perhaps the US military attacked it by mistake Tudor ? I would not call it a mistake :) Knowing that current Ukro authorities can make a move without an order from US embassy it is “highly likely” that lots of ammo went to daesh/nusra. Now it’s time to cover up the shortage. Didn’t they do that a few months ago? The night before the audit, it also went up in smoke. Yeah! Clarity is her 2nd name, is it? It certainly is. The proof of any cabal narrative is always the ‘unified’ and Parrot like use of keywords . UA has a bad habit of exploding SAMs since the Novosibirsk-Tel Aviv flight in the early 2000’s (MH17 was simply 2.0). Not really necessary, as NOBODY will investigate this and dismiss any evidence, or attempts to investigate this as ramblings of Russian trolls. You could probably hide MH370 (the missing one, not the shot down one) in one of those depots and nobody will bother to look in them. I did not know you also write holywood scenarios :-). No as the last time what was there is what the americans stockpiling in Ukraine. They let them bring them in, then light them up for them. I give you one guess who light the fuse. Interesting. Russia also provided the serial numbers, plus, copies of paperwork, relating to the missiles. Were they expecting an audit? Or playing with the new delivery of US weapons, delivered yesterday? Passports were found near the depot. Were they Muslim followers from Iran Tommy ? Or even Muslims from Tehran who recieved training in Russia just after they had training from China ? Plus they had dual passports from Venezuela . Yup lets put ukraine in nato. If they wanted to destroy evidence it is much better ways than what you suggest or the article that obviously the writer trying to create hollywood scenarios so he look intelligent. Beside the rest they say at the end that over look the obvious and go for real moronic brit-dutch style conclusions. I dont mention moronic americans as they are a class all by their own. LOL, they hardly would need to destroy an entire depot for that, for crying out loud. The CIA did it. They are now busy planting evidences to make Russia the culprit. They are very good at that.